This chapter explores the relationship between geoscientific knowledge production and geopolitical agencies in the making of new subsurface resources, specifically unconventional fossil fuels. Focusing on recent controversies surrounding the assessment of potential shale gas resources in Europe, we analyse the ways in which highly speculative and contested resource estimates have come to inform the geopolitical imagination of many EU states and, in turn, provided a new impetus for geoscientific inventories and exploration of shale formations. 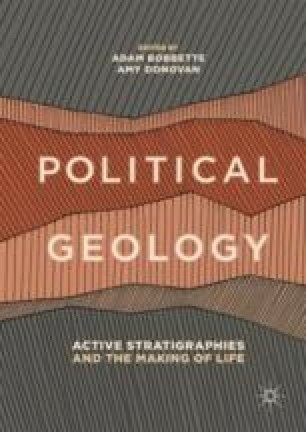 In the first part of the chapter, we engage with recent volumetric accounts in political geography and cognate disciplines to conceptualize these epistemic struggles of resource-making as a case of “subterranean geo-politics”. The empirical analysis in the second part then traces the geo-politics of shale gas prospecting in Poland and the UK, describing how volumetric projections of resource abundance have become undermined by diverse materialities and sociopolitical constructions of the subsurface. This is evidenced by the difficulties of translating knowledge across geo-economically disparate sites of resource development, notably the failure to apply the US-based expertise to the European context. Finally, we document more recent efforts by the European Commission and other epistemic authorities to overcome the deficiency and incompatibility of local resource estimates by developing standard, EU-specific geo-metrics for shale energy assessment. This research is funded by the UK Economic and Social Research Council (grant number: ES/N016351/1) and the Swedish Research Council Formas (grant number: 2015-00455). Anderson, R. (2014). Shale Industry Faces Global Reality Check. BBC News. https://www.bbc.co.uk/news/business-26735000. Barry, A. (2017). Interventions in the Political Geographies of ‘Area’. Political Geography, 57, 101–102. https://www.sciencedirect.com/science/article/pii/S0962629816300014. BEIS. (2017). Digest of UK Energy Statistics (DUKES): Natural Gas. Department for Business, Energy and Industrial Strategy. Available at: https://www.gov.uk/government/statistics/natural-gas-chapter-4-digest-of-united-kingdom-energy-statistics-dukes. Accessed 25 March 2018. Blake, M. (2014). How Hillary Clinton’s State Department Sold Fracking to the World. Mother Jones. Available at: https://www.motherjones.com/politics/2014/09/hillary-clinton-fracking-shale-state-department-chevron/. Accessed 25 June 2018. Carbon Brief. (2017, January 5). Analysis: UK Wind Generated More Electricity Than Coal in 2016. Available at: https://www.carbonbrief.org/analysis-uk-wind-generated-more-electricity-coal-2016. Accessed 25 March 2018. DECC/DCLG. (2015, August 13). Shale Gas and Oil Policy Statement. Available at: https://www.gov.uk/government/publications/shale-gas-and-oil-policy-statement-by-decc-and-dclg/shale-gas-and-oil-policy-statement-by-decc-and-dclg. Accessed 25 June 2018. EIA/ARI. (2013). World Shale Gas and Shale Oil Resource Assessment: Technically Recoverable Shale Gas and Shale Oil Resources: An Assessment of 137 Shale Formations in 41 Countries Outside the United States. US Energy Information Administration/Advanced Resources International. Available at: http://www.eia.gov/analysis/studies/worldshalegas/pdf/fullreport.pdf. EIA/ARI. (2015). World Shale Resource Assessments. U.S. Energy Information Administration/Advanced Resources International. Available at: https://www.eia.gov/analysis/studies/worldshalegas/. Elden, S. (2014). Dynamic Territories. https://icelawproject.org/wheredoesicefitin/reflections-2/dynamic-territories/. FoEE and CEO. (2015). Carte Blanche for Fracking—How the European Commission’s New Advisory Group Is Letting the Shale Gas Industry Set the Agenda. Report by Friends of the Earth Europe and Corporate Europe Observator. Available at: http://corporateeurope.org/sites/default/files/attachments/carte_blanche_for_fracking_final.pdf. Task Force. (2015). Task Force on Shale Gas: Final Conclusions and Recommendations. Available at: https://www.taskforceonshalegas.uk/reports.